Billy Fury was a member of the Larry Parnes stable of singers in the late 1950s/early 1960s. He was born at 8.45am on April 17, 1940, in Smithdown Hospital, Liverpool, now Sefton General Hospital, weighing 6lbs 15oz. Initially, his father Albert (d 1985), a wartime soldier who became a shoemaker, and mother Sarah Jane (known as Jean) Wycherley (b March 25 1921), planned to call him Kenneth, but this was soon changed to Ronald. He was visiting his father in London in 1943 when he was bitten on the right cheek by a dog, resulting in a life-long scar. While living at 34 Haliburton Street, Ron attended St Silas's Infants' School. In 1946, he suffered his first bout of rheumatic fever. This weakened his heart valves, and led to recurrent poor health, and eventually, his death. His first stay in Alder Hey Hospital lasted for two months, during which time he had to lie flat. He was back in hospital a year later. Aged 12, he suffered a relapse, and he was confined to hospital in Wales. After two weeks, he could stand it no longer, and he climbed down a drainpipe from his second floor room. He was caught in nearby fields. During one stay, he overheard a doctor tell his mother he might not live to be 30. In later years, he told many of his friends that he expected to die young. Ron's younger brother Albert (b 26 June 1943) suffered a milder form of the same heart condition and was also admitted to Alder Hey. This left Albert with a murmur which has not caused serious problems. Aged 11, Ron started piano lessons, but three years later, a more significant event occurred, when his parents bought him his first guitar from Frank Hessy's shop as a 14th birthday present. Ron became an enthusiastic strummer, but he was never a great talent on the guitar, and on the rare occasions that he appeared with one, it was little more than a prop. In a later interview, he said he was only ever proficient in three chords. In 1955, aged 15, Ron left Wellington Road Secondary Modern School . He said that his days there were the unhappiest of his young life. His father found him a job at Ellison's Engineering. Initially, he was a tea boy, but he was eventually allowed to heat rivets for the welders. This job lasted for about a year, until Ron and a friend welded together some metal as a joke. The foreman started shouting at Billy in front of his workmates. Billy swung at the foreman with a welding gun...and that was the end of his job. 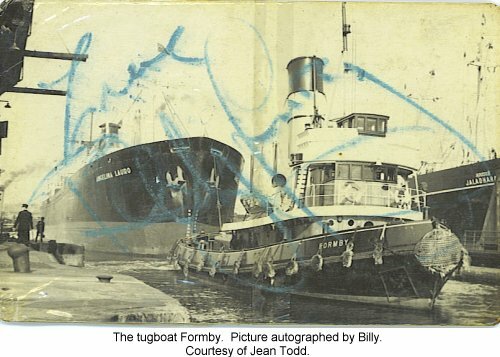 His father found him a job as a deckhand on the tugboat Formby. 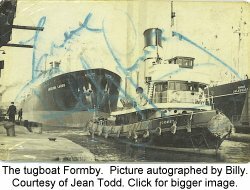 He was inspired by country and western records brought by sailors from New York and formed the Formby Sniffle Group, which performed in local cafés. He recalled later: "I started listening to Hank Williams first, because pop songs then, the lyrics weren't very deep; they weren't the broken-hearted type of lyrics I enjoyed. "Hank Williams and some of the country and western singers were singing about real life and how it feels when you get let down, so I kind of tagged on to their stuff." Ron changed boats, but quickly fell out with the skipper, and this job is said to have ended when 5ft 10½ inch Ron ended an argument by throwing a punch. In 1957, he moved to Joshua Harris's department store, and was inspired by fellow-employee Margo King to write Margo (Don't Go). He played several gigs and both his singing and song-writing abilities begain to impress his limited audience. In May, 1958, he cut six tracks on a 78rpm acetate at Percy F. Phillips' recording studio in Liverpool. He also sent a tape of songs to impresario Larry Parnes, together with a photograph of him at the Star Studio, Bold Street. He received no reply, but in the meantime, Ron entered a local talent contest, Caroll Levis Discoveries, at the Liverpool Empire, but he failed to make a big impression. 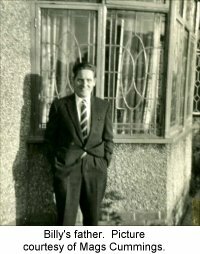 His mother wrote again to Larry Parnes, who this time invited him to see him at the Birkenhead Essoldo on 1st October, when one of his package tours, The Larry Parnes Extravaganza, was being staged. One member of the tour company who spotted Billy at the Essoldo was Brian Bennett, the backing drummer in Marty Wilde's band. He said later: "Billy had a guitar in a plastic bag, and he had a pair of brothel creepers: they were sort of big suede shoes. He had this wonderful, swept-back blond hair." VINCE EAGER RECALLS: We walked out of the stage door and there stood this James Dean look-alike. Raincoat collar up and looking very moody. Ron took his guitar and sang five of his songs to Marty Wilde and Parnes, hoping that Marty would record some of them. Instead, in an episode that has become music legend, Parnes took Billy on stage during the interval, and when the curtains opened, a frightened 18-year-old made his public debut as a singer. He sang Margo, Don't Knock Upon My Door and Maybe Tomorrow. Ron said later that he was so nervous that his knees were literally knocking - but the fans thought it was part of the act. Next day, he and his guitar joined the tour and Billy made his professional debut that night in Stretford. See the programme. The Weekly News reported: Two thousand screaming teenagers held up the programme at Larry Parnes' "Extravaganza".. when 18-years-old Ronnie Wycherley..completed a spot. Billy said: "I don't think my mother and father really believed what had happened when I told them, until I was actually packing my suitcase the next morning. Then my mum got a bit worried about me going off all on my own, but I convinced her it was the biggest chance I'd ever have." Parnes reasoned that no one called Ronald Wycherley would become a rock star, so he renamed him Billy - after band leader Billy Cotton - and Fury, to compensate for the singer's shyness. Ron argued, but as was to prove the case so often, Parnes had his way. Had Ron held sway, the world would have heard the music of "Stean Wade". Billy's first recording, Maybe Tomorrow (one of those he offered to Marty Wilde) went into the Top 20. Within seven months, he had signed a seven year contract with Decca. He made the Sound Of Fury 10-inch album, a rockabilly collection of self-penned numbers, which remains many fans' favourite recording. Every song was recorded during two, three hour sessions. 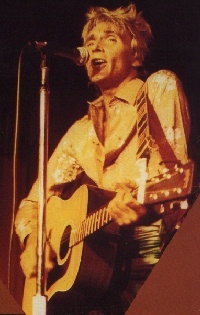 Among the backing instrumentalists is Joe Brown, later to have a number 1 with Picture Of You, and still touring today. For backing vocals, Billy flew the Four Jays from Liverpool at his own expense. The drummer, Andy White, played drums on The Beatles' Love Me Do when Ringo was declared inadequate. One of the groups that auditioned unsuccessfully to become Billy's backing group comprised Johnny Hutch (standing in for Tommy Moore on drums), Stu Sutcliffe, John Lennon, Paul McCartney and George Harrison. For the first time, they called themselves The Silver Beetles. According to pop legend, they were offered the job at £20 a week each if the inexpert Stu Sutcliffe was dropped as bass guitarist, but John Lennon (who had earlier secured Billy's autograph) refused to desert his friend. In the next year, Billy had four more hits, including Colette, on which one of the Vernons Girls sang harmony. Colette was an actress in a sub-titled French film, who so impressed Billy that he wrote the song on a cigarette packet that he found on the floor of the cinema. Billy once explained his song-writing method: "I get an idea when I'm depressed, usually because one of my girls has let me down, and I scribble a lyric and sing the thing straight into a tape recorder. It never gets on to paper until someone at the music publisher puts it there. Then they send me back an arrangement, which I can't read, so I just record it the way I thought of it." Billy loved rock and roll, and he could belt out the real rocking numbers. However, Parnes re-invented him as a balladeer, and in the eyes of the public, Billy became identified with big production numbers. His cover version of Tony Orlando's Halfway To Paradise went to number 3 in 1961, and to many people in the UK, Billy Fury and Paradise are inextricably linked. From 1995-7, listeners to Britain's most popular oldies station, Gem-AM, voted Halfway To Paradise the runner-up in their annual favourite oldies chart. (The winner each year was Unchained Melody by the Righteous Brothers.) Paradise finally reached number 1 in the vote in 1998. He reached number 2 with Jealousy, and while When Will You Say I Love You was at number 3, the top spot was held by From Me To You, by the band that once failed an audition for the job of Billy's backing group. 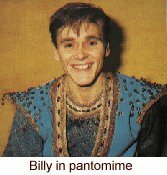 In fact, in the 1960s, Billy had more top 20 hits in the UK than anyone except The Beatles, Cliff Richard and Elvis Presley. Billy's heart problems continued to plague him from the end of 1961. On some tour dates, he had to cut short his act, and on others he would be replaced at the last minute. At the time, fans were told that he was suffering from exhaustion or flu. He was backed by some fine groups, including the Tornados, Georgie Fame And The Blue Flames, an early line-up of Mott The Hoople, and The Gamblers. Billy's good looks made him a natural for television. His first appearance was in a drama, Ted Willis's Strictly For The Sparrows, in which he sang one song. He made his debut in Jack Good's Oh Boy! in February, 1959, then he and Marty Wilde became two of the favourite performers on Jack Good's Boy Meets Girls, which ran from September, 1959 to March 1960. Next, Billy and Marty co-hosted Good's last regular TV series, Wham!, which lasted nine weeks in 1960. In 1962, he made his film debut in Play It Cool, a low budget film that was Michael Winner's first major feature. Other films were I've Gotta Horse, and a guest appearance in That'll Be The Day - the album from this film reached no 1. That May, amid much publicity, he and Parnes flew to Los Angeles to present Elvis Presley with gold and silver discs for UK sales. They met on the Paramount Pictures set of Girls, Girls, Girls. Billy recalled 20 years later: "We didn't really say much at all. I was on the set all day watching him. All we really got to say to each other was: 'Hi'. He was one of the nicest people I ever met - he called everyone 'sir'." As a result, Billy's last release of 1962 was Because Of Love, a ballad from the film. Parnes had knocked a year off Billy's age, believing that this would make him more attractive to girl fans. So on his 22nd birthday, Billy had to pretend it was his 21st, and celebrate appropriately. Frequent illnesses had begun to depress him, but he struggled through variety shows and pantomimes, which he disliked intensely. The new sound created by the other Liverpool lads, led by The Beatles, began to sideline established artists. Although Cliff Richard and Adam Faith retained their following, Marty Wilde, Craig Douglas, Joe Brown, Eden Kane, John Leyton, Mark Wynter and others were struggling to record hit material. After his last top 10 hit, In Thoughts Of You, in 1965, Billy began to take the time to indulge his love of wild life. He became unable to undertake much promotional work after signing with EMI's Parlophone label in 1967, playing cabaret when his health allowed. Billy found peace whenever possible at his home in Ockley, Surrey, to which he moved after fans plagued him at his homes in London. At Ockley, he had a a mock-Tudor mansion with ten acres, where he could assemble a considerable menagerie and play host to the greats of the show business world. Billy eventually needed open heart surgery in 1971. He could not afford private treatment, and was admitted to a National Health Service ward. He then took six months' total rest and enjoyed renewed health for a while, on the 100-acre farm that his partner Lisa Rosen bought for them near Llandovery, Wales. His 11 Parlophone releases covered a bewildering variety of styles. There seemed to be no consistent musical direction and a procession of producers. Audrey ("Lee") Middleton (b 14.2.37), who had been his live-in girlfriend for eight years, left him and married Kenny Everett. Billy married Lee's one-time best friend, Judith Hall, on 31st May 1969, but the marriage was short-lived. The last 12 years of Billy's life were shared with Lisa Rosen. None of his relationships produced children, although Lee had two miscarriages. Lisa provided much-needed financial support, as well as helping Billy to deal with an increasing dependence on alcohol, brought on by bouts of depression. In 1973, Billy resurfaced briefly in the film That'll Be The Day, then in 1976, he needed a second heart operation, and he went into retirement for the rest of the Seventies. He re-recorded his old hits for K-Tel in 1978 as part of an arrangement with his creditors, after being declared bankrupt, owing the Inland Revenue £16,780. Billy always blamed Larry Parnes for the problem, as in the early days, Parnes paid Billy a wage but did not take care of the tax. He was discharged from bankruptcy a year later. A real comeback seemed on the cards in the early 1980s, when he was tempted into the studio again, to record the tracks for an exceptional album, The One And Only Billy Fury, which was issued after his death. On 7th March, 1982, he collapsed at his farm, suffering partial paralysis and temporary blindness. Lisa drove him to hospital in London, and he made a good recovery. A live TV show and a national promotional tour followed, but at 2.10pm on 28th January, 1983*, he was pronounced dead on arrival at St Mary's Hospital, London, after being found unconscious in his flat in Cavendish Avenue, St John's Wood. He apparently died in the ambulance. The heart weakness that had dogged him throughout his life finally claimed him. Picturegoer magazine reported: "Many teenage girls work themselves into a frenzy when watching Fury's action on stage. The cause is one number in Fury's act - an Elvis Presley original called Mean Woman Blues." Billy developed a liking for fast cars and motorcycles. Sound Of Fury is one of the greatest rock and roll albums of its era, and one I swear by. - 1970. Billy is on the record in several publications stating that his favourite food is bacon, sausage and egg, and chopped liver and chips. However, a Radio Luxembourg annual once made the unlikely claim that he had submitted this recipe. "I like to sit by myself without anyone talking to me, just thinking." Unlike most singers of the day, Billy could and did write his own material. The problem was that Larry Parnes wanted a cut of the royalties. So Billy invented Wilber Wilberforce, the phantom songwriter. Wilber wrote the songs, Billy bought them from Wilber, and Wilber collected the royalties. Brian Shuttlewood remembers his encounters with Billy. In the 1960s, New Musical Express (NME) was by far the most influential and popular music paper, and its charts were the most widely-accepted. The Tornados last backed Billy in Amsterdam on 3 January 1963, then left to develop their careers as an independent band. A year later, The Gamblers took over. For some of his last public performances, Billy was backed by The Haleys, and there are reminiscences on their excellent web site. The pages are also cached here.